How do I best remove spider "poop" from my latex painted alluminium siding? The paint has cured for 6 months. I would try mild dishsoap and water first. Use a scrub brush made for cars and gently wash it down. Spray it first with water, and then scrub it gently with soap and water to see if it comes clean, then rinse. Just like a car. Cobweb Cleanup can help, not sure if it will remove the stains. I am not sure if anything will remove stains that may be impregnated into the paint. 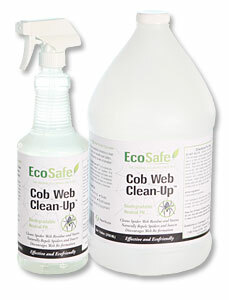 Cobweb Cleanup will also help to repel new spiders and help prevent stains for a while. Reapply every 30 days for best results. I would certainly test a small area first, see if the paint comes clean or if it comes loose from the siding. If primer was used before the paint, it should adhere fairly well. If not, be extremely careful.